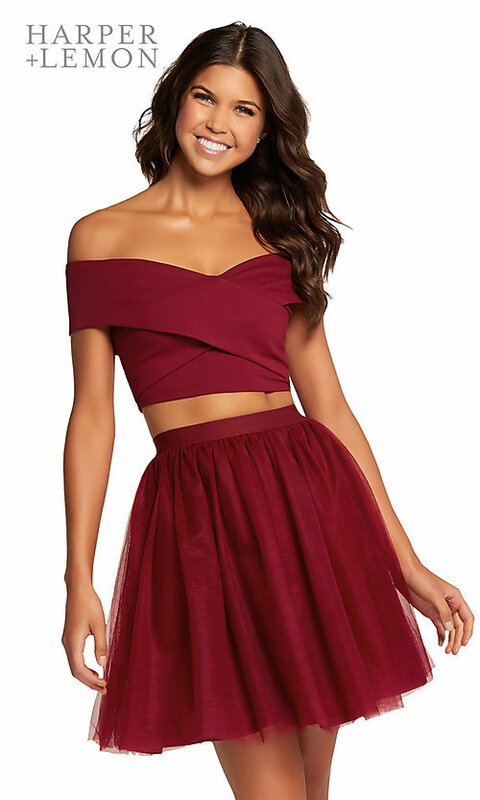 Looking for a two-piece homecoming dress with chic details and a youthful style? For semi-formals or hoco 2019, this delightful party dress is a great find from the designers at Harper and Lemon. Crossing fold-over bands on the sleek off-the-shoulder crop top wrap around the arms and attach in back at the trendy exposed zipper. The multi-layered a-line skirt is gathered at the natural waistline and flows away from the hips for a lovely silhouette. Bargain-priced under $100, this two-piece homecoming dress combines a playful, yet contemporary, look for your special-occasion event.